Under head coach Mary Burke, the Bryant Bulldogs women’s basketball program has developed a strong reputation over the years for producing extremely talented post players. In particular, over the last decade, Bulldog forwards Alex Klein, Breanna Rucker, Naana Ankoma-Mensa, and Kelsey O’Keefe have all earned all-conference honors. So too has current Bulldog, junior forward Sydney Holloway. Holloway was a first team all-conference selection in 2018 as a sophomore, scored her 1,000th career point earlier this season, reaching the milestone faster than any player in Bryant’s D1 history, and is also on track to join Rucker and Ankoma-Mensa with over 1,000 career rebounds. In her first season, Holloway would play a “sixth man” role, seeing 18 minutes a game off of the bench, while averaging 8.3 points and 5.5 rebounds. The two post players in the starting lineup ahead of her, seniors Alex Kline and Morgan Olander, Holloway credits as mentors and a huge help to her making the transition to college basketball and making the adjustment to Coach Burke’s coaching style. The Bulldogs would make a remarkable run in 2017, all the way to their first NEC Championship Game, before falling to longtime nemesis Robert Morris 65-52. Holloway pulled down seven rebounds in 18 minutes of action in her first career final appearance. Earlier this season, the Morgantown native had the opportunity to return home as the Bulldogs traveled down to ‘Almost Heaven’ West Virginia to play the nationally ranked West Virginia Mountaineers. In front of family and friends, Holloway struggled early due to foul trouble, but managed to finish with 16 points and four rebounds. *WHERE THEY STAND: Robert Morris and Sacred Heart continue to pace the league with perfect 6-0 conference records. For RMU, it is the second straight season, and fourth time in program history, they are 6-0 in league play. Meanwhile, SHU starts 6-0 for the first time since their last championship season in 2012. More on these two teams, and their head to head matchup next Monday night, coming up later. Two games back from the league leaders, and sitting in third place, are the St. Francis Brooklyn Terriers at 4-2. This is extra impressive when you consider the Terriers first six league games have included the four teams picked ahead of them in the pre-season poll and the team that knocked them out of the playoffs last year. The Terriers find themselves one game clear of a trio of teams who are tied for fourth place at 3-3: Saint Francis U, Wagner, and Bryant. The Red Flash have lost three in a row since their 3-0 start. Wagner finds themselves at .500 in league play after six games for the first time since the 2003-04 season. Bryant has split each of their first three conference weekends and are coming off of a win on Monday afternoon against the reigning champion Saint Francis U, 66-63. Bryant’s three NEC losses have come by a total of just 9 points: a five-point defeat at home against St. Francis Brooklyn, a 1 point loss at Sacred Heart, and a three-point loss to long-time rival Robert Morris. This battle in the middle of the standings will be fun to watch going forward, as only the top four teams earn quarterfinal home games come March and the NEC Tournament. As for the rest of the league, Mount and FDU are tied for seventh place at 2-4. Finally, Central sits one game back and LIU Brooklyn sits two back, out of the Top 8. *PERFECT STARTS: As we approach the halfway point of the conference schedule, both Robert Morris and Sacred Heart are still sporting undefeated league records. One way or another that will change this week as they both play games on Saturday and then play each other on Monday. 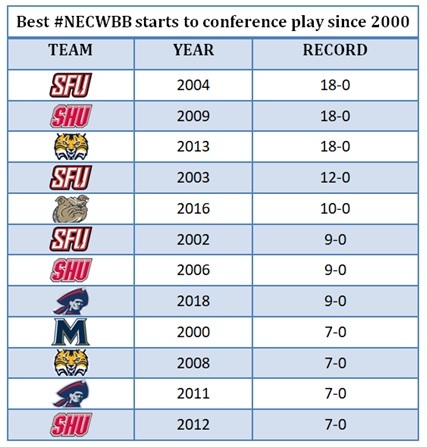 However, if one of these teams does make it through a fourth conference weekend still unblemished at 8-0, they would be entering some pretty impressive space in the league record books, sitting among the best starts in NEC history. *BATTLE OF BROOKLYN: A LOOK BACK: For the third straight year, and for the sixth time in the last seven years, borough bragging rights belong on Remsen Street, as the St. Francis Brooklyn Terriers defeated LIU Brooklyn 79-67 on Monday afternoon to take the 26th annual Battle of Brooklyn. In a game that featured six ties and six lead changes, the Terriers broke the game open in a third quarter that became the Jade Johnson show. The St. Francis Brooklyn junior recorded 15 of the Terriers 21 third quarter points. The key stretch started when LIU grabbed the lead 42-41 with 6:48 to go in the quarter. Johnson was fouled while shooting a three, then went to the stripe and knocked down three straight free throws. She followed that up with back to back threes from the corners, and suddenly, within the span of 1:43, the Terriers went from down one to up eight, and they never looked back. Johnson would earn her second straight Battle of Brooklyn MVP award, scoring a Battle of Brooklyn record and personal career high 33 points. She went 8-10 from beyond the arc, setting a new program record for most threes in a single game. While Johnson’s numbers will get plenty of attention, the job Amy O’Neill did of running the floor at the point, Ally Lassen’s continued improvement and presence in the post with 16 points and 5 rebounds in her second start of the year, and the team committing only 15 turnovers when they average nearly 19 a game, where all huge contributing factors to the victory as well. With the win, the Terriers tie up the Battle of Brooklyn all-time series 13-13, forcing the series into deadlock for the first time since 2005. 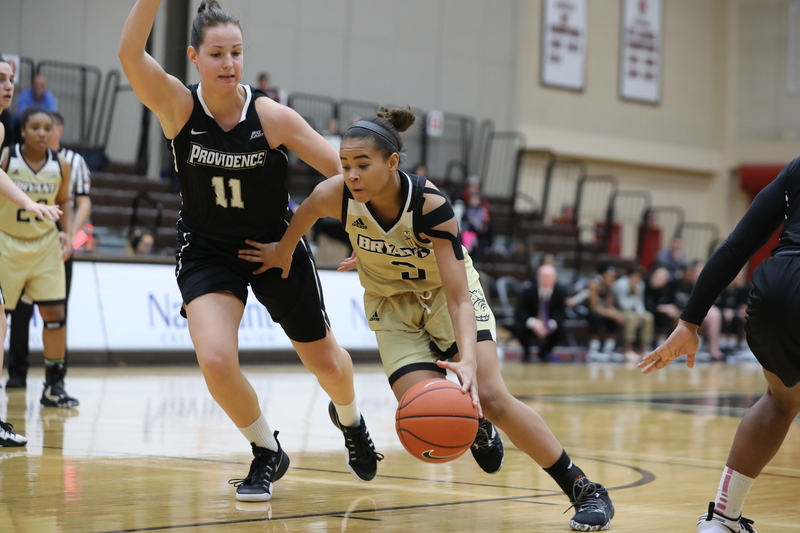 Already there is added historical intrigue to the 2020 Battle of Brooklyn in the Pope PE Center next year, as the Terriers will look to grab the series lead outright for the first time since 2000 and Jade Johnson will have a chance to become only the second woman ever to win three straight Battle of Brooklyn MVP awards. *TRIPLE DOUBLE: Sacred Heart grad student Katherine Haines made history on Saturday afternoon, recording 25 points, 15 rebounds, and a school record tying 11 blocks in the Pioneers’ contest against St. Francis Brooklyn, recording Sacred Heart’s first ever triple-double. The triple double was the 24th in the NCAA this year, the 11th in league history, and the first in the NEC since Wagner’s Jasmine Nwajei had 16 points, 10 rebounds, and 10 assists in a December 2015 game against NJIT. Haines’ triple double is just the second in league history to involve blocks, with the other coming back in February 2014 by Wagner’s Ugo Nwaigwe when she had 12 points, 19 rebounds, and 13 blocks in a league game against Fairleigh Dickinson. Entering this season, there were just 71 recorded triple-doubles involving blocks in NCAA history.
.@SHUBigRed moved to 5-0 against #NECWBB opponents w/ today's victory and Katherine Haines tallied the 11th TRIPLE-DOUBLE in league history. *1,000 POINTS: Congratulations go out again to Sacred Heart grad student Katherine Haines, who joined Central Connecticut’s Kiana Patterson and Bryant’s Sydney Holloway as the third Northeast Conference women’s basketball player to eclipse the 1,000 career point milestone so far in the 2018-19 season. Haines reached the mark on a fourth quarter layup on Monday afternoon against Wagner. She becomes the 20th player in Pioneer program history, and the 13th in the SHU D1 era, to reach 1,000 points. Looking ahead, other NEC women’s basketball players on track to possibly reach 1,000 points later on this season include: SFBK’s Maria Palarino (16 points away), SFBK’s Jade Johnson (119 points away), FDU’s Madelynn Comly (131 points away), and SHU’s Erin Storck (218 points away). *MOUNT MONDAYS: Monday’s are the one day of the week that gets very little love. Whether it’s back to school or back to work, it’s very rare that the mention of a Monday draws an immediate positive thought to someone’s mind. Even the Carpenters sang about how rainy days and Mondays always got them down. However, for Mount St. Mary’s, having a “case of the Mondays” has been quite a good thing. They have played some of their most efficient and inspired basketball during the first three Mondays of the conference season, all after coming off some less than stellar performances on the first three Saturdays. Consider the following…Mount St. Mary’s was picked fifth in the pre-season poll and had one of their best non-conference seasons in recent memory, finishing over .500 in non-conference play for the first time since 1999-00. Going into their first conference game against Robert Morris (on a Saturday), the Mount stood second in the league in field goal percentage (41.1%) and third in scoring (68.7ppg). Against RMU, Mount shot 31%, 3-16 from three, and was able to muster only 58 points. The following Saturday, Mount had a 14 point lead in the fourth quarter against Bryant at home, but couldn’t finish, and saw the game slip through their fingertips. Finally, this past Saturday, Mount fell behind 25-7 in the first quarter to Wagner, trailed by as many as 33, and allowed a total of 92 points for the game. On the other hand, Mondays have been much kinder. Even the first one, a loss to Saint Francis, was a bounce back performance from their RMU game. Mount fought back in the second half and Daly Sullivan had a chance to win the game at the buzzer. The following Monday, following the Bryant disappointment, Coach Marchesano’s group played perhaps their best 40 minutes of basketball so far during conference season. They jumped out to a 26-5 lead after one quarter and led 49-15 at the half against Central. Mount shot a ‘lights out’ 51.6% for the game, and knocked home 11 threes. Finally, this past Monday, after allowing a season high 92 points to Wagner just 48 hours earlier, they allowed a season-low 47 points to FDU. To Mount’s credit, after each miscue or disappointment from Saturday’s results, they have managed to come back to correct it in a big way 48 hours later. From the fourth quarter struggles against Bryant to perhaps their best shooting half against Central. Then from allowing a season high 92 points against Wagner to surrendering a season low 47 points against FDU. It’s a weird pattern that, three weeks in, is starting to become a real thing to pay attention to. Perhaps changing all of the calendars in the building to Mondays will help? In all seriousness, Mount will be looking to change/end this trend when they host LIU Brooklyn, a team still in search of their first conference victory, this Saturday before welcoming in St. Francis Brooklyn to Knott Arena on Monday night. *JERSEY RETIREMENTS: This season has been exciting with the announcements of numerous jersey retirements. Some elite NEC women’s basketball all-time greats will be receiving the ultimate honor of being permanently raised to the rafters at their respective schools this winter. Already this season, back on December 15th, St. Francis Brooklyn retired the #15 of Jeanne Zatorski. Zatorski was the first woman inducted into the St. Francis Brooklyn Hall of Fame in 1987 and stands third on the Terriers all time in points and rebounds. The Terriers aren’t done yet though, as they will also retire the #40 of the program’s all-time leading scorer Karen Erving-Schiera. Erving is the Terriers all-time leading scorer and rebounder with 1,929 points and 1,049 rebounds. For most of the 1990’s, Erving was the leading scorer in league history. Erving will be honored at halftime of St. Francis Brooklyn’s February 9th game against Fairleigh Dickinson. This Saturday, Mount St. Mary’s will retire the #24 of two-time NEC Player of the Year, and former head coach, Vanessa Blair. Blair was a member of the Mount’s first D1 recruiting class, won three regular season league titles as a player, and then returned a few years after graduation to serve as head coach from 1998-2007. She stands as the only person in program history to be named both NEC Player of the Year and Coach of the Year, and was named to the Northeast Conference Hall of Fame back in the 2012-13 season. Blair will join her former teammate, Susie Rowlyk, as the only two Mountaineers to have their number retired. Finally, on February 9th in Loretto, Saint Francis U will retire the jersey of arguably the most decorated women’s basketball student-athlete in league history, Jess Zinobile. Zinobile won four straight championships, three NEC Tournament MVP awards, two league MVP honors, and was a three-time first team All-Conference selection. Up until this past December, Zinobile was the leading scorer in league history, only to be surpassed by current Red Flash senior Jess Kovatch. The NEC Hall of Famer’s #22 will be the first female athlete’s number retired in Saint Francis history. First place will be on the line on Monday night in Moon Township as the Pioneers complete their PA road trip by visiting the NEC pre-season favorite, the Robert Morris Colonials. Potentially, this could be a battle between two NEC unbeatens, however both teams will have to survive Saturday’s action first, as RMU hosts Wagner and Sacred Heart visits SFU. Should either or both teams slip up on Saturday, Monday’s game is still assured to have first place implications, as both teams currently stand two games ahead of third place St. Francis Brooklyn in the standings. For the fourth time in history and for the second straight season, the Colonials are off to a 6-0 start in conference play. On the offensive side of the ball the Colonials have been incredibly balanced and efficient. Eight different players have led the team in scoring in a game this year. One player, Nneka Ezeigbo, averages in double figures scoring, but after that, the next seven top scorers average between 8.2 and 5.1 points per game. On the defensive side, RMU leads the NEC, and stands 33rd in the nation, only allowing 57.1 points per game. The Colonials also are 31st in the nation in forcing 20.88 turnovers per game. In contrast, the Pioneers are one of the best ball control teams in country, ranking 25th, only committing 13.4 turnovers per game. They have four players in double figure scoring: Katherine Haines, Adrianne Hagood, Erin Storck, and Candice Leatherwood. The Pioneers, off to their first 6-0 start since their last championship season in 2012, recently won a pair of tight games with a defensive stop on the final possession. Last week, Erin Storck blocked Haley Connors’ three point attempt at the buzzer for a 49-48 win over Bryant. Then this past weekend, Haines first recorded a block with 17 seconds left and then the Pioneers denied St. Francis Brooklyn a final shot opportunity at the buzzer to hold on for a 68-66 win. One of the most intriguing matchups in this game will surely be in the post, where Robert Morris will have Nneka Ezeigbo and Ire-Ozzy Momodu battling with Katherine Haines for both points and rebounds. RMU has had the scoring advantage in the paint 5 out of their 6 conference games, while SHU has been in control 4 out of their 6. Robert Morris has defeated Sacred Heart five straight times at home, and swept both meetings against the Pios, for the first time ever, during last year’s regular season. RMU shot a ridiculous 61% and put up 91 points during the first meeting in Fairfield, and then won a 60-49 contest at home a month later (keyed by an early 19-0 run), shooting a still outstanding 55% from the field. Whoever comes out on top on Monday will have the advantage of sitting at the top of the mountain in the NEC standings as the league nears the halfway point of the conference season and the completion of the first go-around in the double round-robin schedule. If indeed both Robert Morris and Sacred Heart make it to Monday both unbeaten in the NEC, it will mark the first time two league unbeatens will meet this late into a season since 6-0 Robert Morris visited 7-0 Sacred Heart back on January 23, 2006 at the Pitt Center, with the Pioneers coming away with a 78-59 win. SHU would eventually go on to win their first nine NEC games that year before finally tasting defeat. They would also go on to win their very first NEC championship later that March. THREE: Amy O’Neill, SR (SFBK): The Terriers senior point guard continues to fill up the stat sheet and contribute in many different ways. On Saturday against the Pioneers, O’Neill helped spark a second half St. Francis comeback effort by pouring in a career high 20 points. In a game where a triple double was recorded from the opposite side, O’Neill flirted with one of her own, tallying nine rebounds and nine assists. In the Battle of Brooklyn on Monday, O’Neill found herself in triple-double watch once again, finishing with 9 points, 11 rebounds, and 8 assists. O’Neill leads the NEC and stands 4th in the nation in assists and has produced 8 or more assists in a game on 11 different occasions this year. TWO: Jade Johnson, JR (SFBK): For the second straight week, Jade Johnson earns our #2 “Star of the Week.” After struggling most of the day on Saturday against Sacred Heart with 8 points on 3-12 shooting and 0-5 from downtown, Johnson set new records and reached new career highs in the Battle of Brooklyn on Monday. The junior guard smashed the Battle of Brooklyn single game scoring record and set a new personal career high with 33 points. She did it on 10-16 shooting and 8-10 for three. The eight three point field goals set a new school record for most threes in a game. Since the start of conference play, Johnson is averaging 19.3 points on 48.8% shooting from the field and 47.8% shooting from beyond the arc. ONE: Katherine Haines, GR (SHU): I think it’s a rule somewhere that if you record the 11th triple-double in league history (only the second one involving blocks) and then follow it up 48 hours later by scoring your 1,000th career point, then it’s a no-brainer and you have to be locked in as the #1 “Star of the Week.” And so with that, Haines tops our Star list for the second straight week. Haines was scary good on Saturday. She tied a program record with 11 blocks, dominated down low both scoring and rebounding, and even stepped back at one point and knocked down a three. Haines’ run of three straight 20 point games and three straight games of both double-digit points and rebounds came to an end when she recorded ‘only’ 19 points against Wagner. In the process Haines became the 20th Pioneer to reach the 1,000 point milestone. The SHU grad student is averaging 20.5 points and 10.2 rebounds over the first three weekends of conference play. *Only one player in NEC history has recorded multiple triple-doubles in their career, and that is Robert Morris’ Chinata Nesbit. Back in 2008, Nesbit recorded 16 points, 10 rebounds, and 12 assists against Mount, before an 18 point, 24 rebound, 10 assist outing just 11 days layer in the NEC Tournament quarterfinals against St. Francis Brooklyn. Thank you to Bryant junior Sydney Holloway and Assistant Coach Jonathan Parsons for taking the time to talk to us this week for our feature story. Join us back here at the NEC Overtime! Blog next Wednesday, January 30th for a brand new WBB Fast Break column featuring a special round table chat with Sacred Heart’s grad student trio of Katherine Haines, Erin Storck, and Kiana Ye as we discuss life as a grad-student student-athlete and Sacred Heart’s early conference season success.